“Just watch me.” Nearly fifty years after the fact, Prime Minister Pierre Trudeau’s defiant quip lives on. But what else remains in the Canadian consciousness about the 1970 October Crisis? Canadians watched — in shock, awe, or disgust — as Trudeau invoked the War Measures Act, sending soldiers with “guns and helmets” into the streets of Montreal and Quebec City and authorizing police to round up people with connections, real or concocted, to the Front de Libération du Québec (FLQ) and its kidnapping of a diplomat and politician. In the subsequent debate over the impact of the sweeping powers regarding civil liberties in Canada, the scope and deadly impact of the FLQ’s campaign of politically motivated violence — terrorism — has drifted into the mists of time. With Quebec having recently elected a former separatist cabinet minister as premier, heading a party largely formed from disaffected sovereignists, a fresh look at the most startlingly dramatic period in the province’s political evolution is timely. D’Arcy Jenish, a journalist and the author of several previous works of historical non-fiction, including three about hockey, has written a brisk, well-researched, and richly detailed account of the “two hundred bombings, dozens of bank robberies, six deaths, and two kidnappings” that jangled Quebec’s nerves from early 1963 until the fateful fall of 1970. The book is a much-expanded version of a feature story Jenish wrote in 2010 for Legion magazine on the fortieth anniversary of the October Crisis. As with that article, the book has the benefit of an exceptional living witness to bring readers as close to the scene as you’d want to get: Montreal police officer Robert Côté, a key member and eventual leader of the force’s bomb squad, who personally defused dozens of FLQ bombs. 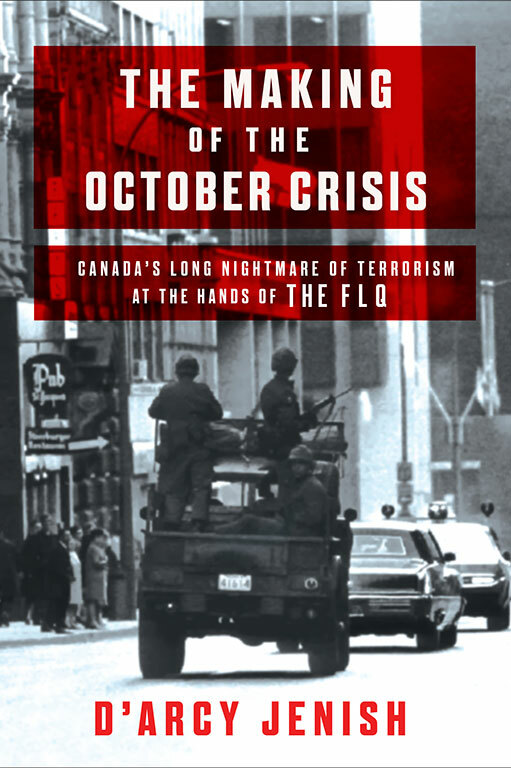 Much has been written about the FLQ’s terror spree, “a peacetime crisis unlike any that came before or since,” including memoirs from key players at the time and a surprising number of accounts by the terrorists themselves. Jenish adds a worthwhile, highly readable, comprehensive, and judiciously balanced account of the episode. He situates the FLQ revolutionaries as very much creatures of the time, where movements around the world, most of them driven by communist ideology, were seeking to toss off the yoke of colonialism through violent tactics. In particular, the FLQ militants looked to the struggles for liberation happening in Cuba and Algeria. The FLQ’s tactics shifted from bombings to kidnappings in 1970. An initial target was an Israeli official, but that plot was foiled when police pulled over the plotters’ van with a faulty tail light. The U.S. consul in Montreal was also targeted, but that scheme, too, was uncovered. So it was finally British trade commissioner James Cross who was the prey when kidnappers rang at his Westmount door early in the morning of October 5, with a “birthday present” for the diplomat. Members of another FLQ cell were in Texas raising money through fraud scams when they heard of the Cross kidnapping. They raced back to Quebec and made plans to kidnap their own target. They settled on Quebec Labour Minister Pierre Laporte, who had the fatal misfortune of living within a short drive of an FLQ hideaway. He was kidnapped on October 10 and then strangled to death with his own gold crucifix chain on October 17. The death of Pierre Laporte and the Cross kidnapping — Cross was released after eight weeks in captivity — marked the end of the FLQ as a force for Quebec independence; but it was not the end of the separatist movement, with the Parti Québécois taking power through the ballot box six years later. For those who have forgotten much of the detail of the October Crisis and its roots, and for those for whom it’s undiscovered territory, Jenish has written a must-read guide. Peter Black is a long-time Quebec City resident, former CBC Radio journalist, freelance writer for a variety of media, and regular columnist for the Quebec Chronicle-Telegraph, Sherbrooke Record, and Plattsburgh Press-Republican. Book Review: Author Alan Livingstone MacLeod recounts the tales of hockey players who served Canada during the First World War.